Figure 7.7 Examples of current vulnerabilities of fresh water resources and their management; in the background, a water stress map based on Alcamo et al. (2003a). See text for relation to climate change. Desiccation of Lake Chad: (a) 1973 (b) 2007. The lake is very shallow and is particularly sensitive to small changes in average depth, and seasonal variation. An increased demand on the lake's water from the local population has probably accelerated its shrinkage over the past 40 years; also, over-grazing in the area surrounding the lake causes desertification and a decline in vegetation. (1) Mentioned earlier in the chapter was that as the rate of warming increases, up to one-half of the mass of mountain glaciers and small ice caps outside the polar regions may melt away over the next hundred years. In fact if current warming rates are maintained it is projected that Himalayan glaciers could decay by 80% of their area by the 2030s. Snow melt is an important source of run-off and watersheds will be severely affected by glacier and snow cover decline. As temperatures rise, winter run-off will initially increase while spring high water, summer and autumn flows will be reduced. Particularly seriously affected will be river basins dependent on the Hindu-Kush-Himalaya glaciated region in Asia (e.g. the Indus, Ganges-Brahmaputra and Yangtze rivers) where more than one-sixth of the world's population currently lives, and those dependent on glaciers in the South American Andes. In many areas, there could be large changes in the seasonal distribution of river flow and water supply for hydroelectric generation and agriculture. 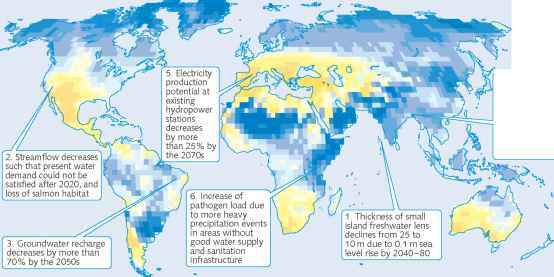 For instance, in Europe a decrease in hydropower potential of about 10% has been projected by the 2070s. 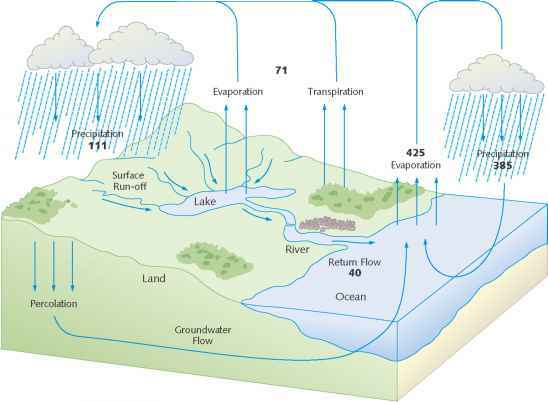 Figure 7.8 Illustrative map of future climate change impacts on fresh water which are a threat to the sustainable development of the affected regions. The background map is of the ensemble mean change in annual run-off in per cent between (1981-2000) and (2081- 2100) for the SRES A1B emissions scenario. (2) Many semi-arid areas (e.g. Mediterranean basin, western USA, southern Africa, northeastern Brazil and parts of Australia) will suffer serious decreases in water resources due to climate change. These problems will be particularly acute in semi-arid or arid low-income countries, where precipitation and streamflow are concentrated over a few months and where the variability of precipitation is likely to increase as climate changes. 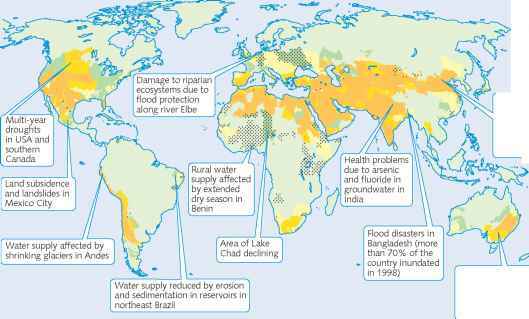 (3) Due to increases in population in addition to climate change, the number of people living in severely stressed river basins is projected to increase from about 1.5 billion in 1995 to 3 to 5 billion in 2050 for the SRES B2 scenario. of both floods and droughts of about a factor of 5 that were mentioned in Chapter 6 will have very large implications for water availability and management. (5) Groundwater recharge will decrease considerably in some already water-stressed regions where vulnerability may be exacerbated by increase in population and water demand. (6) Sea level rise together with greater use of groundwater will extend areas of salination of groundwater and estuaries, resulting in a decrease in fresh water availability for humans and ecosystems in coastal areas. (7) Higher water temperatures, increased precipitation intensity and longer periods of low flows exacerbate many forms of water pollution, with impacts on ecosystems, human health and water system reliability and operating costs. (8) A further reason, not unconnected with global warming, for the vulnerability of water supplies is the link between rainfall and changes in land use. Extensive deforestation can lead to large changes in rainfall (see box on page 208). A similar tendency to reduced rainfall can be expected if there is a reduction in vegetation over large areas of semi-arid regions. Such changes can have a devastating and widespread effect and assist in the process of desertification. This is a potential threat to the drylands covering about one-quarter of the land area of the world (see box on page 197). 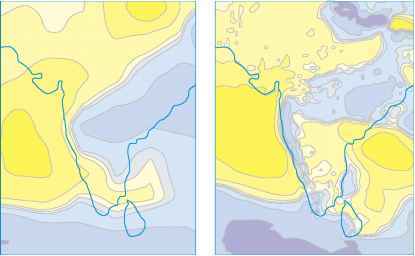 Figure 7.9 Predicted changes in monsoon rainfall (mm day-1) over India between the present day and the middle of the twenty-first century from a 300-km resolution GCM and from a 50-km resolution RCM. The RCM pattern is very different in some respects from the coarser resolution pattern of the GCM. average parameters with likely changes in frequency, intensity and location of extreme events. Firstly, increasing the effi ciency of water use. For instance, irrigation applied to about one-sixth of the world's farmland producing about one-third of the world's crops and accounting for about two-thirds of world water use, can be made much more effi cient. Most irrigation is through open ditches, which is very wasteful of water; over 60% is lost through evaporation and seepage. Microirrigation techniques, in which perforated pipes deliver water directly to the plants, provide large opportunities for water conservation, making it possible to expand irrigated fields without building new dams. Many other efficiency measures are also available, for instance, to recycle water where possible, to promote indigenous practices for sustainable water use (e.g. local rainwater storage), to conserve water (and also soil) by avoiding deforestation or increasing forested areas and to use economic incentives to encourage water conservation. Secondly, looking for new water supplies. For instance, by increasing water storage in reservoirs or dams, by desalination of sea water, by transferring water from areas of greater abundance or by prospecting and extracting groundwater in appropriate areas. Thirdly, by introducing more informed management. For instance, regions such as Southeast Asia that are dependent on unregulated river systems are more vulnerable to change than regions such as western Russia and the western United States that have large, regulated water resource systems. Many interested experts and bodies are promoting Integrated water management that involves all sectors - agricultural, domestic and industrial - relates to existing infrastructure and plans for new infrastructure and also, most importantly, includes preparation for disasters such as major floods and droughts.